Henry Collin, better known as Muchias, was one of John Walter’s oldest employees and friends. Muchias was born on February 24, 1853. His father, Richard Collin, was a Hudson’s Bay Company employee and his mother, Genevieve Brevjeres, was of Cree descent from Lac Ste. Anne. Muchias had dwarfism and stood only 4 feet tall. As a young man, he found work at Fort Edmonton as a water bearer, hauling water up from the banks of the North Saskatchewan to the Fort. He developed a powerful physical strength and endurance and there are many stories noting his abilities, such as carrying four-hundred pound bales. As one story notes, to win a bet he carried a 98 pound flour sack to Fort Saskatchewan without stopping. 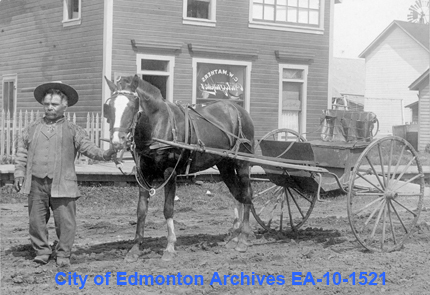 EA-10-1521 Muchias with his cart and pony in front of C.W. Mathers Studio. 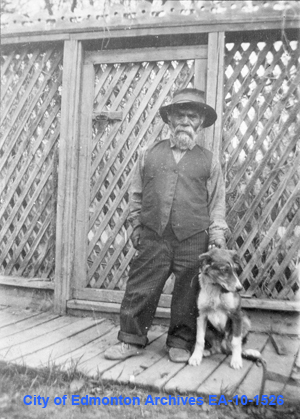 Muchias and John Walter would have met at Fort Edmonton. Little is known of this time, but some type of favourable impression was made as Muchias eventually left the employment of the Hudson’s Bay Company and came to work for John Walter. Some accounts say that Muchias, the “faithful servant,” followed John when he left the company in 1875. More likely Muchias left the company around 1886. In that year, a cabin custom fitted for Muchias’ small stature was built on John Walter’s property. Muchias worked for John as a labourer and handyman for the family. Muchias made an impression on the people of Edmonton. Many vivid recollections of Muchias, the layout of his cabin and his character have been recorded. People, including the Walter children and grandchildren, fondly remembered Muchias. He was known as an expert archer and skilled riverman. He was also well known for his ability to connect with children, spending time with them and making them toys such as bow and arrows. Of course, the children all found that their arrow points were not very sharp because Muchias designed them with safety in mind. EAA-1-9 Ella May Walker's rendition if Muchias's house. This home, along with Muchias himself left a strong impression. When John Walter passed away in 1920, Muchias stayed on to help Mrs. Walter with the chores around the property. He lived in his cabin until 1936, when he suffered 3 strokes. 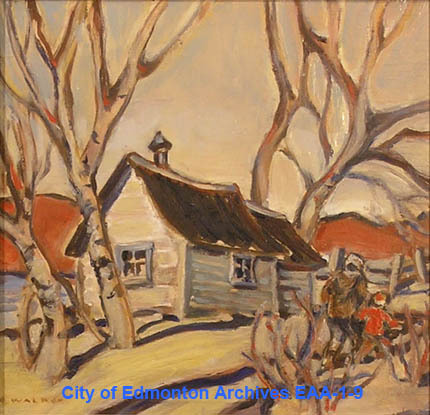 He moved to St. Albert and was taken care of by family until his death on the 21st of September 1939.